imwellconfused.me.uk: Times and bikes change, but the fun increases! Times and bikes change, but the fun increases! Change was needed fast and came thanks to volunteering, swapping and safety checks the girls have new old bikes, the sort of bikes that have been around the block a bit but still raring to go, similar to Grampsbike the Raliegh. 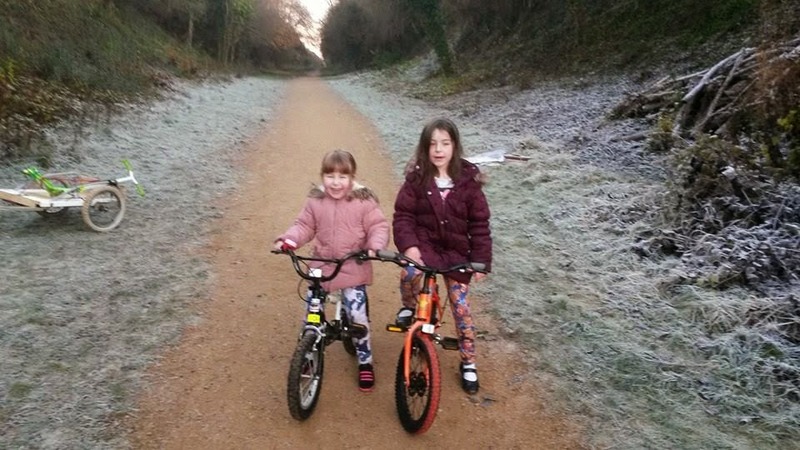 It may be 2 degrees but they like their bikes! On the left we have Lissy's Bronx Dinosaur bike. It's a 14 inch wheeled affair kitted out with a 2014 Selle Royale Lollipop seat and lightweight Kalloy components to help reduce weight but retain strength. There's the odd scratch here and there but when in the mood she can blat twice as fast with little effort, even hills are a breeze for her right now. On the Right we have Vee's Universal Typhoon in faded orange a 16 Inch wheeled bike with an older 2010 Selle Royale Lollipop seat and funky tyres. This one has been a tad more well loved in comparison to Lissy's but it's doing well for it's estimate age. It's bought Vee's confidence out so much in just over a week so it's a win in my eyes. While both will have some minor work done work done to them they're both ready to rock and already providing hours of fun for both girls, even on cold days like Saturday! Bring on the #SchoolPedal!